Few countries in the world can rival Peru for the sheer drama of its archeological sites and the awesome physical beauty of its landscapes. Add distinctive cultures and Peru provides award-worthy adventures. The mist-shrouded peaks of the Andes Mountains envelop Machu Picchu, the Lost City of the Incas, once thought to be mere legend. 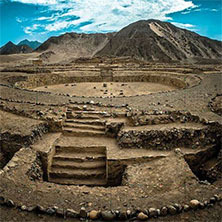 The Sacred Valley and the royal tomb of Sipan testify to the early inhabitants of Peru. Intriguing riddles remain unsolved such as the dry desert site of the famed Nazca Lines. Peru shares the world’s highest navigable body of water, Lake Titicaca, with Bolivia. Other Peruvian gems include the rainforest of the upper Amazon River; and Colca Canyon, with depths of 11,000 feet, making it twice that of the Grand Canyon. Many of Peru’s ancient cultures and traditions are still splendidly alive in villages such as Pisaq, Willoq, and the floating islands of the Uros culture, where families live much as their ancestors did. Whether hiking the ancient Inca trail, strolling the narrow streets of colonial Cusco, or boating remote Amazonian headwaters, a Peru luxury tour is rather like an extraordinary gourmet meal, where every morsel tastes better than the one before. 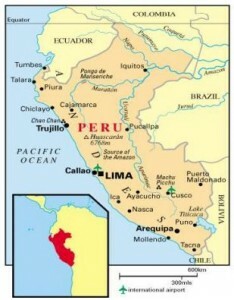 The electric voltage in Peru is 220 volts, 60 cycles. Most hotel bathrooms include an electric outlet with 110 volts for electric shavers but not to be used for irons or hairdryers. "I am a big fan of Peru because of its variety of experiences. In this program, I love the opportunities to hike spectacular mountains, and walking into the archeological sites like Kuelap is like walking straight into the past. This is one of the largest ancient stone complexes in the western hemisphere, and Caral-Supe is another – a 5000-year-old site that is oldest center of civilization in all the Americas. Journeys like this offer us the chance to experience a bit of what the early explorers might have felt." It was growing dark as our small group of five made its way along a dark path into the now-closed sanctuary led by our Peruvian guide. It was a nearly unheard of stroke of luck that we received special permission to enter the magnificent Machu Picchu mountain fortress at night. We entered one of the small, roofless stone houses. Now completely dark, we sat in a circle on the dirt floor, legs crossed, as our guide started a small fire. He laid out his ‘table’, a small brightly woven square of cloth. As he began to place his small offerings of food, sweets, herbs, wood and wool, he explained in a whisper that this was the Peruvian way to thank or pay tribute to Mother Earth. Each item had a spiritual purpose. I turned my face to the sky and the stars seemed impossibly brilliant. I can’t honestly say I heard the rest of what he said. I was simply enveloped, mesmerized by the night, the smoke curling up toward the stars, the low hum of his voice and the fire light flickering off the faces of the others. Explore some of Peru's extraordinary landscapes from the amazing Amazon Rainforest, where you stay in a treehouse and take an unforgettable journey from the Andes to the Pacific Coast on the brand new Interoceanic Highway. Encounter with river communities to learn how they coexist with the remarkable environment. Travel by train through simply spectacular mountain scenery as your train winds through dramatic scenery to reach the monumental mountain fortress of Machu Picchu... the Lost City of the Incas. Get an aerial look at the mythic Nazca Lines and Palpa Lines, ancient geoglyphs in the desert as well the oldest Chakana (Andean Southern Cross) that can be seen from the air. For those returning to Peru or those looking to go off the most popular routes, this adventure presents new experiences and challenges to explore a fascinating region of Peru. It takes in important archaeological sites such as Chan Chan and the Royal Tombs of Sipan, shows you the remarkable Nazca Lines and the people of Lake Titicaca. Explore Incan culinary traditions through their use of quinoa, a grain developed more than 5,000 years ago in Peru. Travel into the Andes to the remarkable mountain Incan fortress of Machu Picchu. Explore Peru's culinary traditions as you explore its capital city, Lima. See Pachacamac, an archaeological site overlooking the Pacific Ocean that predates the Inca Empire. Visit the Quechua village of Chinchero to learn about their traditions and the ancient textile techniques they still employ. Discover Urubamba (Sacred) Valley, the ruins of Moray, ancient agricultural terraces, and Maras with its nearby salt pans. Then take in the awe-inspiring site of Machu Picchu, 7,900 feet into the Andes. Savor a train journey aboard the luxurious Hiram Bingham that travels through the high Andean landscapes. Peru is rich in art and architecture of both the Inca and Spanish Colonial. Explore two of Peru’s most fascinating cities; Lima and Cusco. Travel to the Andean village of Pisaq in the fertile Urubamba (Sacred Valley). Then enjoy a train journey to Machu Picchu, rolling through spectacular, evolving landscapes. Venture into the sanctuary fortress of Machu Picchu and discover the ruins of Moray. 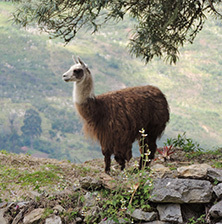 This Peru journey is a great vacation for families with something for everyone including family-friendly museums, white water rafting, a picnic in the Andes, the chance to see the magnificent Andean condor, a preserve for llamas, vicunas and alpacas, and a train journey through the mountains to one of the world’s most dramatic archaeological sites… Machu Picchu. Spend a remarkable night in a completely transparent bedroom hanging from the side of a mountain; and travel to the edge of Colca Canyon, the deepest canyon on the planet. Trek along the old route of the Inca Trail, and discover White City of Arequipa. Explore the fascinating colonial city of Cusco. Along the way, enjoy comfortable lodges, watch Andean condors soar, visit small villages and Incan ruins. Take in Colca Canyon, the deepest canyon in the world, where you see families of condors, and enjoy mountain biking and hiking opportunities along the rim.